As post-surgical scars go, the one on the right elbow of Los Angeles Dodgers reliever Todd Coffey looks pretty nasty. 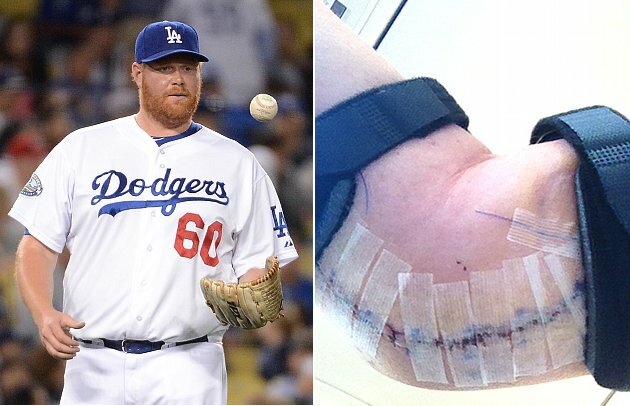 Apparently not wanting to face the prospect of recovering from Tommy John ligament replacement surgery alone, Coffey got the world involved on Thursday by transmitting a lovely photograph of his elbow so everyone might see what the surgeons hath wrought. Like the head of Anakin Skywalker in "Return of the Jedi," it looks. As True Blue L.A. reports, this is the second Tommy John of Coffey's career. He missed the entire 2000 season after undergoing it in August 1999 when he was with the Reds organization. It probably will take a year for Coffey to return from this and be back terrifying children everywhere with his maniacal run from the bullpen. Coffey, who turns 31 in September, finished the season with a 4.66 ERA and 18 strikeouts in 19 1/3 innings for the Dodgers. He has a 4.10 ERA, having logged 438 1/3 innings in his career for four teams, also including the Nationals and Brewers. Hopefully it won't be a longer rehab, but that scar... yeesh. Love baseball? Even like it a little? along with the BLS Facebook page!